Due to several requests, we have decided to move the deadline for the Poem Competition to AUGUST 15, 2016. We hope that we have answered all questions. The names of the authors nominated are in no specific order. All of them are among the best. We would nominate many others but .... there is a finite number of authors that can be nominated. We congratulate the authors and we hope they will win. A new issue has been live for the last five days and we hope you find it interesting and entertaining. We are confident that it features great poems and stories but also great non-fiction pieces. Take your time to read them: they are worth it. Now, it is the moment when we announce our winners for the June issue for the three categories: poems, short-stories and non-fiction. What we can say is that it has been a very tight race, which was to be expected considering the quality of the pieces featured in the previous issue. Scarlet Leaf Review was lucky enough to feature very talented authors. We know you liked them because we can see how many people visited our literary review. We are also proud to let you know that 41,571 people visited the magazine during the period June 15 - July 14, 2016. Right now, we can boast with a total number of hits between January 15 and July 20, 2016 of 206,301. Within a few days, between July 15 and today, we have had 11,824 visitors on the site. CONGRATULATIONS TO EVERY ONE OF THE WINNERS! 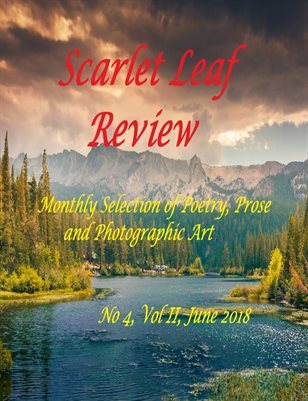 A HUGE THANK YOU TO EVERY ONE OF THE AUTHORS THAT HAVE PUBLISHED WITH SCARLET LEAF REVIEW!